Available in 5 different grit combinations, these 5 3/4" x 1/2" size files taper to a 15 degree angle, allowing you finishing capabilities you didn't have before. Use for removing flash and surface imperfections from metal and hard surfaces and take advantage of the fact that they are long lasting. After use, rinse in water, dry and store for future use. The Micro-Mesh® MX series gives you options ranging from 60MX to 1200 MX grade or choose the variety pack for the entire series of 5. 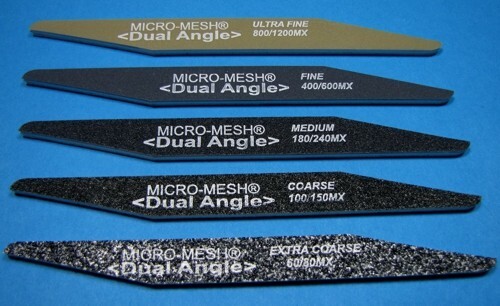 Each file has a corresponding finer grade on the opposite side so the entire set includes 10 grades of Micro-Mesh® MX.